It had been rumoured that David Haye could be coming out of retirement to fight Vitali Kiltschko in March, it was thought that Haye’s management team had been in negotiations with Vitali’s team to make the fight happen between the two. Vitali Klitschko’s management team has today confirmed that they have made David Haye an offer to fight and have insisted that the ball is now in Haye’s court. David Haye lost a points decision to Vitali’s brother Wladimir in July, citing a broken toe the reason he could not perform on the day. The Londoner tried to get Wladimir to agree to a rematch, but the calls fell on deaf ears. The Hayemaker officially retired from boxing on his 31st birthday in October, something the fighter always suggested he would do. 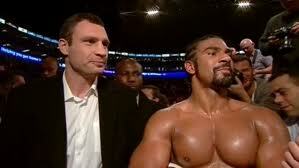 Haye has claimed after retiring that he merely retired from fighting anyone without the Klitschko name, Vitali has always said that he would like the opportunity to fight Haye and do what his brother failed to do, which was knock the Hayemaker out.